Arnie acknowledges the fact that it may always be more difficult for him to concentrate and pay attention in his classroom, but he feels confident in the sensory tools he has available to help him succeed. This book is a great match for any child with a high engine, to help them understand they are not alone and there are strategies that may help them participate in the classroom and in daily life. Many children on the autism spectrum find it hard to understand the hidden curriculum that peers seem to naturally follow. For example, young adults will typically speak more formally to a grandparent, while they may use more “colorful” language around peers. During an elementary school band concert, most children will not proclaim loudly their opinion that the musicians sound horrible. While everyone in the audience may indeed be thinking the same thing, the hidden curriculum protocol for this situation is to sit quietly and congratulate the musicians on their hard work, rather than offer a critique. Many of our culture’s social expectations depend on the context at hand: it may be appropriate to greet a favorite cousin with a fist bump at the park, but not at a funeral. These concepts are typically not directly taught, and the majority of children will follow along, or respond to subtle cues, such as a parent pursing their lips and raising their eyebrows to indicate disapproval. Children on the autism spectrum have difficulty noticing and interpreting these types of social cues. They require more specific lessons regarding the hidden curriculum. 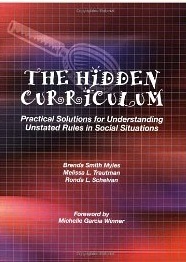 The Hidden Curriculum offers parents and caregivers a look into the complexity of social protocols, and presents lists of potential challenges in topics from personal hygiene, rules for different types of restaurants, and classroom guidelines. It also includes a list of common idioms and the meaning behind them (e.g. “You’re killing me” really means to make another person laugh, not actually kill them). Available from major booksellers and the Autism Asperger Publishing Company. 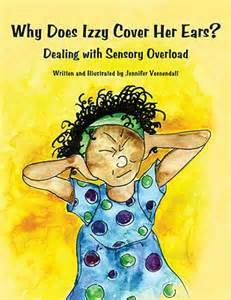 While there are many books on the market for parents to better understand sensory processing disorder (SPD), there are few books designed to help children understand SPD. Although children’s fiction books are an excellent way to help a child see that there are other children who also experience SPD, Making Sense of Your Senses takes this a step further. 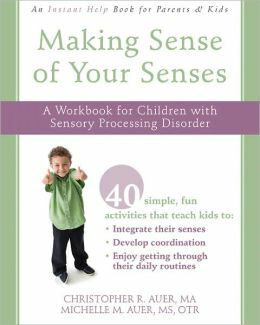 This workbook includes 40 different activities for children and their parents to explore what types of sensory input are difficult to tolerate, what types of input are beneficial and what can be done to help them participate in every day activities. Each activity begins with a short vignette about a child who faces this difficulty. The activities are short and provide the child opportunity to identify the different sensory systems and how they impact daily life at school and home. While the workbook is primarily text-based, there are hands-on activity suggestions and areas for the child to use drawings to describe their sensory experiences. 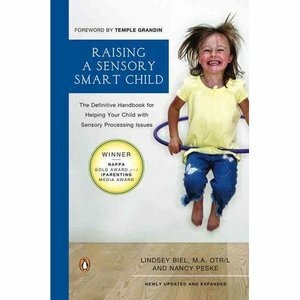 This book is best suited for ages 5 and up, with the guidance of a parent or caregiver. 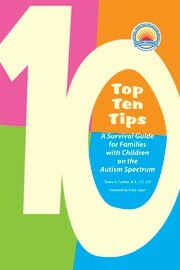 Top Ten Tips: A Survival Guild for Families with Children on the Autism Spectrum is just that: a set of over 50 “Top Ten” lists relating to a wide range of practical, everyday topics. 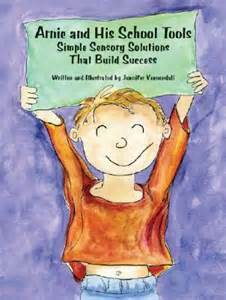 Although the title focuses on children with an ASD, much of the information presented in this book could also be appropriate for a child with sensory processing disorder or other related difficulties. The lists were compiled by Teresa Cardon, MA, CCC-SLP, with contributors including parents and siblings of individuals on the autism spectrum, occupational therapists, special education teachers, speech therapists, social workers and others who interact with individuals with autism. Top Ten Tips is a perfect book for the busy family who does not have the time to sit down and read a long narrative, but is looking for useful ways to manage daily events. The book consists entirely of easy to read lists with tried and true ideas to handle the difficulties that can arise around potty training, winning and losing games, homework, grocery shopping, birthday parties and more.